Nearest in sonic genealogy to Stano were 2 disparate entities – The Virgin Prunes, who by 1983 were at a cumulative watershed after 2 years of highly potent releases – And Roger Doyle, who in 1981 released one of the most fascinatingly leftfield Irish records ever, Rapid Eye Movements, under the name Operating Theatre, before using the same guise to create some slightly unfortunate pop singles. As with many independent records of the era, Content to Write in I Dine Weathercraft has become somewhat of a rarity. In years of trawling around Dublin record shops (when there were many of them), I only ever saw the original Scoff pressing of this once, and in a fairly unloved condition. Probably more common was the debut 7” ROOM/TOWN, released in 1982 by Vox magazine. And if that strange and wonderfully weird record wasn’t enough to confuse anyone who knew Stano from punk band the Threat, then a whole album’s worth of music in unmapped territory probably sent those with tribal affiliations and parochial tastes running for cover. Stano’s approach to creating the music for Content to Write in I Dine Weathercraft had more in common with the operations of a dub producer than a solo artist or band member – each collaborator drawn into the mix for a specific skillset to experiment with – but would be inaccurate to explain this away as being the work of an glorified engineer, conductor or simply as a curator… perhaps that role was best left undefined or vague, as the very individual talents of Roger Doyle, Donald Teskey, Michael O’Shea, Vinnie Murphy and Jerome Rimson (probably best known around these parts for being a member of Phil Lynott’s solo band) were syphoned to best effect. Initially released by Scoff records in 1983 (with English and Greek pressings following in 1985), it is somewhat surprising, but not at all unwelcome, that this reissue would be handled by All City Records’ reissue label AllChival. I always thought of them as being firmly in the dance/electro/hip-hop field, and an obscurity of this nature is a risk for anyone to invest their faith in. …The album opens with the skewed post-punk funk of WHITE FIELD (IN ISIS), interplaying Jerome Rimson’s fluid and dominating bass with a vocal mantra and unashamedly programmed percussion. Present throughout the album, the era-specific sound palate of synthetic rhythm endures simply because of the unorthodox and DIY nature of its implementation. A more skillful command of the drum machine would certainly have dated the album harshly. SEANCE OF A KONDALIKE is awash with string reverberations, twisted screams and features the homemade instruments of Michael O’Shea (a kind of Irish Laraaji). This is distinctive in its gothic folksy din, bearing the hallmark DNA of Virgin Prunes creepiness. BLUE GLIDE’s spoken vocals and pangs of brash guitar come across as the capturing of a moment of loose and improvised experimentation. Featuring Roger Doyle, OUT OF THE DARK, INTO THE DAWN is the first of several piano based tracks on the album. It locks in with a sparse and understated percussion, building on an initial mood and momentarily threatening to drag the tone askew before reconciling the elements with a brief vocal section as the track comes to a close. YOUNG COLATIC CHILD works with a similar melancholy and instrumentation, but here Stano delivers a cascade of lyrics with all the nasal snarl of an UNDER THE FLAG era Frank Tovey. FOX initially pretends to be a playful closer to side one, but its nightmare undercurrent of creepy rusted fairgrounds and sleep paralysis keep it lingering in a grey area between reality and mind trickery. MELTING GREY opens side two with backward washes, effects and heavy clangs of percussion… it’s the most “industrial” sounding of anything on the record. WHALE makes for a brief and sedate interlude of acoustic guitar and spoken vocals before EMMA WILD kicks in with its glorious no-wave twisting funk bass, synth and ranting vocals. This is one of the undoubted jewels of the album. A DEAD ROSE brings with it a vague eastern influence with chiming Sitar and percussion programmed to mimic a hand drum pattern. VIXEN is an echo-y cocktail of vaudeville piano layers, revisiting the themes of FOX from side 1, but maybe aiming for something a little more whimsical and luring before the nightmare begins. Finally, we arrive at the first single, ROOM. The unlikely mix of bleak grand piano, natural room reverb and drum machine has always made this a dejected affair. Probably the most successful track at evoking the era of it’s conception, this is a ROOM of bad peeling 70’s wallpaper, rotting windowsills, black damp and the last blue flutter from a Superser as the cylinder runs out of gas. 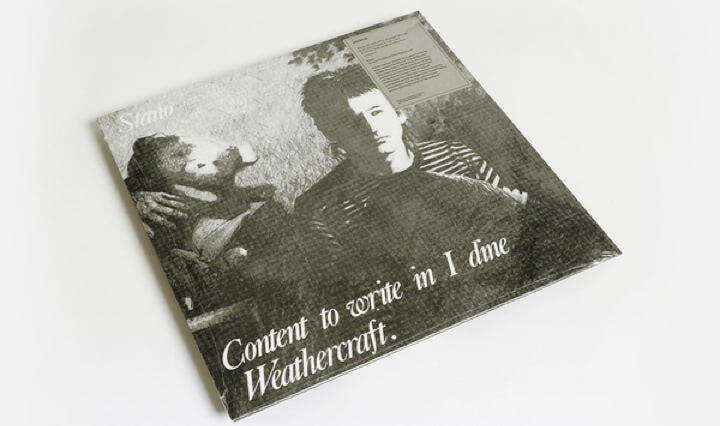 However divisive it may have sounded 35 years ago, this reissue presents Content to Write in I Dine Weathercraft as a record of deep thought, DIY process and creative bravery. It successfully combines musical sophistication and radical experimentation with clunky technology and sometimes-impenetrable dream logic poetry. Although there were similarly minded records in post-punk England, this is an Irish stand-alone. And as Stano’s music slowly ebbed towards something more polished over the next 3 albums, this record retained its distinction of being the strange and creepy first-born of the discography. The only downside of the reissue is that space couldn’t be found to include Town, the flipside of the debut single.